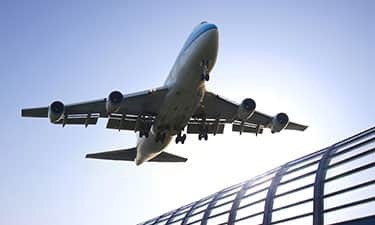 If you’ve got a business trip to Glasgow or Amsterdam, our hotels near Bournemouth Airport are perfectly placed so you won’t miss your flight. If you’ve planned a beach break to Ibiza or Lanzarote, warm up with Bournemouth’s seven miles of gold sandy beaches and an unusually warm (for England) microclimate. There’s plenty to do before and after you fly. Wander around the town centre, hopping from cafes to beach to galleries. If it’s raining, maybe spend the day exploring nearby Kingston Lacey, an Italian-inspired mansion. Book a hotel near Bournemouth Airport and have a walk around the town centre. It’s compact and the beach lines all of it. As everything is so close, when your kids get bored of one thing, simply move onto the other. Watch the surfers (or try it yourself) at Bournemouth Beach. For a bit of competition, play a round of crazy golf. Not for you? Take a stroll round the Lower Gardens – if it’s Christmas, there’s usually a charming craft market nearby. From here, our Bournemouth Seafront Hotel is a ten minute walk. What if you could have great views and art at the same time?, Visit Russel-Cotes Museum and Art Gallery. Given as a gift to his wife, this grand house has impressive sea views. Our Bournemouth Hotel is just a mile away. Further afield, you’ll love Compton Acres with its different themed gardens. From the Japanese Garden, where you cross the stream via stepping stones, to the Wooded Valley, with big waterfalls and snaking paths, this place will instil wonder. It’s an easy three-mile drive from our Bournemouth Seafront Hotel. If it’s raining, explore Kingston Lacy instead. The home was transformed by explorer/adventurer William John Bankes. Must-see Moment: Check out the largest private collection of Egyptian artefacts in the UK. Our Ringwood Hotel is a 20-minute drive away and only 6.7 miles from the airport.